Rhubarb & almond muffins with cinnamon & nutmeg! I added cinnamon, nutmeg & finely ground almonds to the muffins. These ingredients add a lot of flavour. I didn’t want to use butter & substituted it for canola oil. I also used unsweetened kefir, without added cream, to lighten the muffins. It is a lot healthier & lighter that way. I added coconut sugar because it adds a lot of flavour to the rhubarb. Tasty bit more moist interior! 380 gr fresh rhubarb, washed, cleaned & pad dry with kitchen paper, cut up into little chunks. 1/4 teaspoon of ground cinnamon or more according to your taste/ I used less because I didn’t want the cinnamon to overpower the muffins. 300 ml unsweetened Kefir, no added cream!!!! 1. Preheat the oven to 190° C.( 375 F ) I always use a fan oven. Adjust your oven to the right temperature. 2. Take your not silicon muffin pan & line with colourful muffin papers. I used my 12 holes muffin pan. I also used my silicon, 6 larger holes, muffin or mini cakes moulds. Why? Because I got it for a present & I didn’t use it before. 3. Take a large bowl & place flour, ground almonds, nutmeg & cinnamon together. Mix well. 4. In another large bowl, beat coconut sugar, kefir, oil, beaten egg & vanilla extract together until all well joined. Stir this mixture into the flour mixture until just joined. Don’t overmix! Now, carefully fold in the rhubarb pieces. 5. My silicon bake ware, I don’t have to grease it. Spoon the mix into the holes of the silicon pan until 3/4 or 4/4 filled. Fill the muffin papers until everything is used up. Fill them also for 3/4 or for 4/4! 6. Place them in the oven on oven trays & bake for about 20 to 25 minutes or until the muffins are risen & golden on top. Test with an oven skewer & prick in the middle of the muffins to see if they are done. If not, place into the oven for a few more minutes. Turn the oven off. Take the trays out of the oven. Leave the muffins for about 5 to 10 minutes into the silicon moulds. They will be shiny on the outside afterwords. After 5 minutes, you can take them easily out of the moulds. The other muffins , you can take them easily out with the muffin papers. Let them all cool off on wire racks. 7. When they are completely cooled off, you can place them in 2 airtight containers. These are lovely on their own or they can be enjoyed with some cinnamon tea or with some good ice cream.Yum! Stay tuned, Subscribe by email through the link below to get my new cool newsletters aka posts! Join 1,800 email Subscribers! It is free! Previous Post It is Asparagus Season! Ooh yes! Next Post My favourite ricotta sandwich! Archive post! They look super moist! Love the use of kefir in these muffins, Sophie. Tasty looking muffins, dear Sophie! Yum Yum Yummmm! Can’t wait to try these, Sophie. I love the use of almond flour here too. Of course, rhubarb is a favorite at my house! wow these looks delicious! Super moist. Rhubarb muffins are tops in my book 🙂 This look delish, Sophie. Oh, my! So yummy. I love rhubarb. Have a great weekend! Thanks, Katarina! 🙂 Enjoy them! that looks very moist and yummy! I like the glazed look on the muffin top. Never, really! Rhubarb is one of those veggies that are in nearly all Belgian gardens,…:) If you love it, I have lots of rhubarb recipes on my blog, filed under recipes by ingredient, under rhubarb! In the right side corner of my blog! 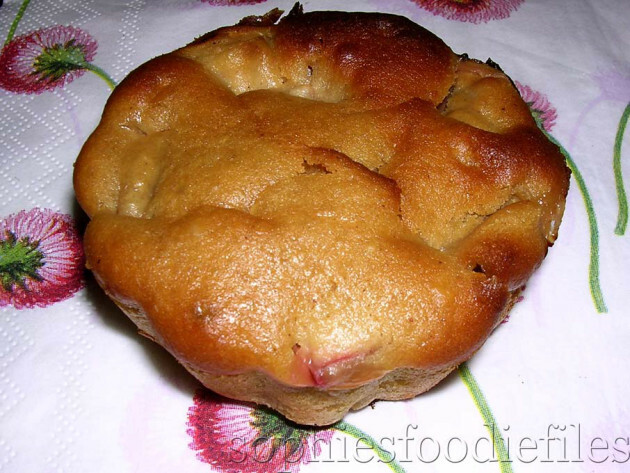 That sure is a very moist muffin, local rhubarb should be coming to the market soon. Sometimes, I like my muffins to be moist. X Enjoy, Norma..a tasty brekkie too. There is nothing better than fresh rhubarb from the garden! Your muffins look fantastic! Thanks, dear friend! x Enjoy them! Rhubarb is grown in almost every Belgian garden, Hannah! We are all grown up with it! I used here the normal green-red sort! You are the rhubarb queen!! I haven’t seen any rhubarb over here in NZ yet, but I have a whole bag frozen in my freezer at home…sigh. How brilliant to use kefir, Sophie, I have never tried that! Yum, I love rhubarb – it’s so lovely and tart! 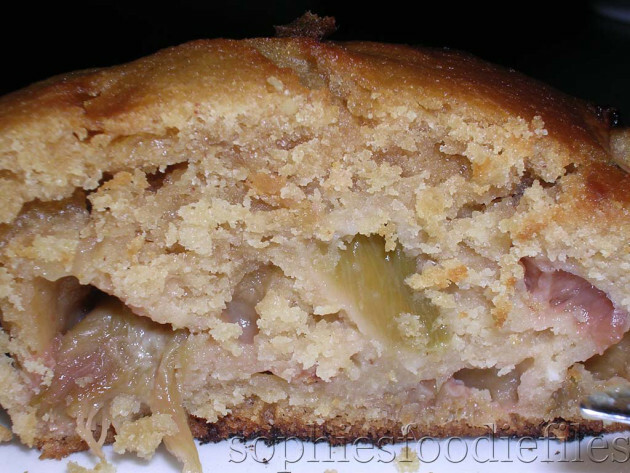 Sophie – love love rhubarb…can’t wait till ours is ready – yum! Thanj you, sweet Rhonda! Enjoy them!